If you opt to play a tournament you will the go the tournament sign up desk. If you do not know what tournament you would like to play, there are generally screens in the room showing the daily tournament options. Alternately, the podium will generally have a sheet describing the tournaments that will be played that day. Once you have chosen your tournament you will proceed to the sign-up desk and hand over your player’s card and your buy in. The desk will give you a receipt for your money indicating your table and seat assignment. Often they will give you two copies, one for your records and one to hand to the dealer to confirm you are sitting in the right seat. You can ask the desk to direct you to the tournament tables. Once you are headed in the right direction, you should see numbers at each table (either on the table itself, hanging above the table, or on the back of the dealer’s chair). Seats are counted clockwise from the dealer. So the seat directly to the left of the dealer is seat 1. Followed by seat 2, seat 3, etc. Most No Limit Hold’em tournaments have 9 or 10 seats at each table, although there are variations and other games that may have fewer. Once you have found your seat, hand your slip to the dealer and he will confirm that you are in the right place. While you are waiting for the tournament to begin you might want to familiarize yourself with the denominations of chips in your stack to help prevent incorrect betting during play. Also, find the tournament screen which will tell you during the tournament the current blind level, how long is left at that blind level, what the next blind level will be, and when you can expect the next break. The screen will also typically tell you the number of players starting the tournament, how many are left, and the average stack size of remaining players. Finally, once the buy-in period is closed, the screen will tell you the prize pool and how much each paid spot will earn. If you are unfamiliar with the general rules of tournament play, check out our Rules of Tournament Poker page, which is also useful if you want to run your own home tournament. As this is a tournament, and the chips have no cash value, there is no tipping of dealers during play. If tipping is done, it happens among those who have moneyed in the tournament and decide what percentage of winnings they would like to give to the dealers. Dealers rotate through tables during tournaments and split tips, so you just give your tip to your current dealer and they will divide those among the dealers. Alternately, sometimes there is a box where you can place your tip. You should also check how your buy-in amount was apportioned. 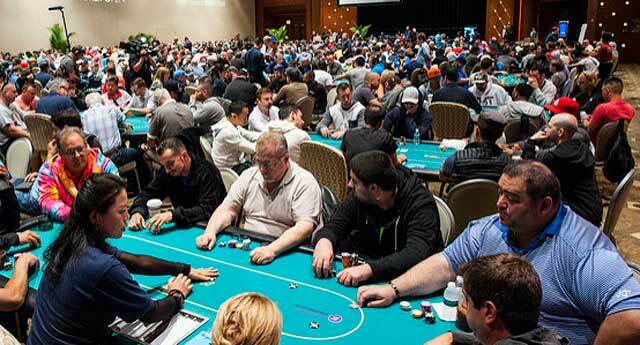 Beyond the portion used for winners payments and the card room’s take, sometimes there is a portion that is held out to compensate the dealers as well, a defacto tip. You may choose to tip beyond that but it is important to know if the dealers already are receiving some gratuity form your buy-in. If you finish in the money, you will see the floor and they will pay you or direct you how you will be paid. Often when there are only a few players left in a game, and no one has many blinds left because they have grown so large, a “chop” will be proposed – basically a division of the remaining winnings at that point in time to stop the game (e.g., if 4 players remain and there is $4,000 left to pay out those 4 slots). If the stacks are relatively even, an exact share to all may be proposed. If someone has a much larger stack, there may be an agreement that one player receives more than the others. There also can be an “equity” chop where the floor counts each player’s stack and the payments are made on the basis of relative chip stacks sizes. What is key, is that every player remaining must agree about the conditions of the chop. Otherwise, play continues until there is a single winner (or the card room closes for the evening and enforces an equity chop).